The city is one of the first UK locations to pilot Gfast technology, offering download speeds up to 330Mbps – about seven times the UK average. People using Gfast can download a two hour HD film in just 90 seconds, a 45 minute HD TV show in 16 seconds and a nine hour audio book in three seconds. Locations in Leeds set to benefit include parts of the following wards: Armley, Beeston and Holbeck, Bramley and Stanningley, City and Hunslet, Farnley and Wortley, Middleton Park, Pudsey and Rothwell. 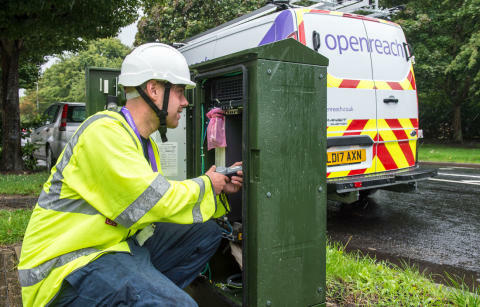 Derek Richardson, Openreach’s programme director for Yorkshire and the Humber, said: “It’s great news that Leeds is playing a leading role in the development of this exciting new technology. Gfast will help transform the broadband picture in the UK by ushering in a new era where ultrafast speeds are widely available. The rollout of Gfast builds on the existing deployment of fibre technology across the Leeds area where more than 97 per cent of homes and businesses already have access to high-speed broadband. Derek Richardson added:“Pilot schemes, such as this one in Leeds, are important for us to fully test the new network in a number of different situations before it reaches millions of homes and businesses across the UK. The areas we’ve chosen are carefully selected based on a variety of factors, including engineering considerations and the need to test the technology for a range of communities.